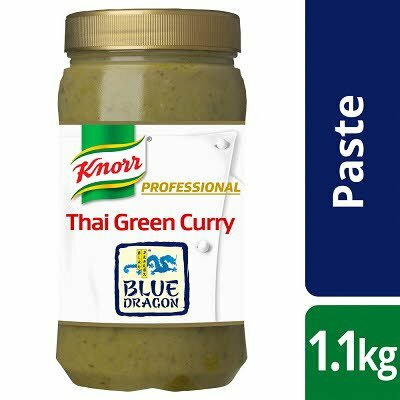 A Thai style green curry paste including lemongrass, green Bird’s eye chillies, Thai basil, galangal and Kaffir lime leaves. Water, rapeseed oil, minced lemongrass (7%), green birds eye chillies (6%), garlic puree (5%), FISH sauce [ANCHOVY extract (FISH), salt, sugar], sliced green peppers, thai basil (3.5%), modified maize starch, minced galangal (3%), kaffir lime leaves (3%), sugar, coriander leaf, ground coriander (0.5%), ground cumin (0.3%), acidity regulator (citric acid), ground cardamom (0.2%), salt, colour (chlorophylls). Use straight from the jar as desired or according to the recipe suggestion. - Once opened, keep refrigerated and use within 2 weeks, or freeze remaining contents immediately.